This is partially adapted from a post I wrote for the late lamented Multiply.Com in March 2010. 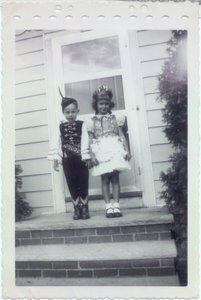 That’s me at the age of five with my pretty little first cousin Peggy. Both of us are wearing Hungarian folk dancing costumes—but I’m not quite sure about how those cowboy boots fit in. Knowing what a stubborn little cuss I was, I probably insisted on wearing them instead of the traditional black leather boots. Stubbornness was very much a part of my early years. I did not like being photographed: Many of my early snapshots show me glowering at the camera. And I most certainly didn’t like to dance. Even in those days, I had no idea how to move in time with music without punishing the feet of my partners. Of course, that made me fiercely unpopular with all my dancing partners; and that didn’t make for enjoyable dancing lessons. Although I played the alto saxophone for many years, it was with little pleasure. By a fluke, I became first saxophone in my high school band; but Chuck Matousek, who played second sax, was much better than me. He could play “Night Train” from memory: I couldn’t play anything from memory.